Okay, here we go... This deck was quickly/roughly made over a period of 3 hours. 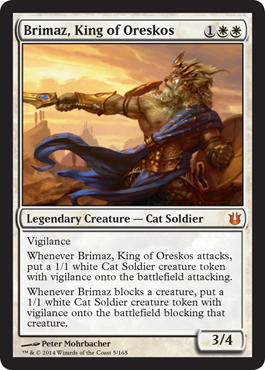 It features one of our newest legendary creatures, Brimaz, King of Oreskos. Honestly, I find single color decks to be difficult to build for Commander/EDH. In theory, you have so much to pull from, but when it comes to building it, you'll look and say "I want this to be unblockable" and remember that unblockable/"can't be blocked" belongs to blue, or "I want this to be hexproof" and you remember that hexproof belongs to blue or green. Artifacts fill the gaps in some cases, but it still is quite difficult to do single color decks. I think considering what I was trying to accomplish, I believe I did quite well. Cats in Magic is not a very large demographic, but there are still many cards with that subtype, and narrowing down to just white creatures, you still have many. One cool thing about them is that there are several with lifelink, so let's do a white lifegain deck? The only regular creature that isn't a cat subtype is Archangel of Thune. I mean, why not boost everything with all the life you gain? So that's what this does. We also have some token generating going on, so we need things to help that along. Brimaz, Ajani's Pridemate, and Ajani, Caller of the Pride put tokens on the field, but that's not all, so how are we going to boost these tokens? Spear of Heliod and Intangible Virtue, of course! And if +1/+1 counters and super life gain doesn't finish the job for you with your multitude of cats, we have another solution: White Devotion, through Nykthos, Shrine to Nyx resulting in some very nasty Eldrazi. With all of the possibilities in this mono-white deck, you should be able to do well, I believe. It's definitely an interesting build.